The Phoenix | Pub Quizzers | Find a pub quiz near you, now. 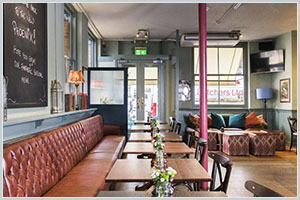 Pub quizzes take place at The Phoenix, Chelsea on Sundays (weekly) at 19:00. Entry is £2.00, you can have up to 10 people on a team. There are prizes of spot prizes, drinks. Happy quizzing! Join us every Sunday in Chelsea for our quiz night at The Phoenix! Test those brain cells and win some fantastic prizes! There is a £50 food and bar tab for the winning team, bonus drinks throughout the evening and a bottle of wine for those smart enough to come in second-to-last place. That's not all, there is a rollover over cash jackpot up for grabs every week! Don't miss the best Sunday evening entertainment in Chelsea!